≈ It’s in All the New Kitchens! The front of that big locomotive takes a beating! Giving it a protective coating which could withstand weather and the abrasion of sand and cinders was almost impossible — until an extra-tough finish was perfected by paint and finish scientists. Now a gleaming, white version of that finish is in the new kitchens . . . on stoves, washers and other appliances that get the most abuse! And what a finish! It withstands hot grease, boiling water, scouring chemicals, scratches. When you buy furniture, appliances or other household items, get the extra life and wear that a quality finish offers, by remembering: At the start, consider the finish! From 1949, someone’s idea of a clever slogan for the National Paint, Varnish and Lacquer Association. (Although we suppose that when you’re the National Paint, Varnish and Lacquer Association, you take what you can get.) 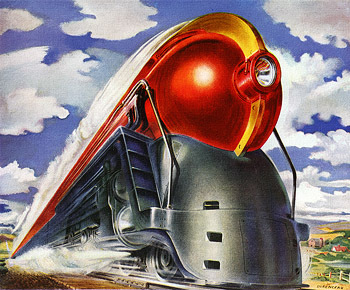 Much more memorable in this ad are the visuals — a striking polychrome locomotive painted by Andre Durenceau, who, not surprisingly, at one time worked for Technicolor. 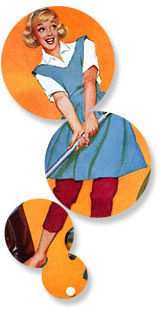 ≈ Do Any Washday Job in Seconds! It’s true — and isn’t it wonderful? Wash a family-size 9-pound load in your Hamilton with a Touch! to set temperature and Suds-Saver. A Touch! to select the right washing cycle for regular or delicate loads. On your Hamilton Dryer, just Touch! and get perfect “drying weather” for each fabric type. And a Touch! for just the right drying period. At your Dealer’s, see how easily Hamilton takes the work out of washday! Just Touch! — and away you Go! We wonder if there was some sort of Madison Avenue Pulitzer (a Maddy?) for copywriting that went to the genius responsible for this annoyingly insistent masterpiece of exclamatory italics from 1956. It leaves us deeply Touched! Never before such glamour in an automobile! 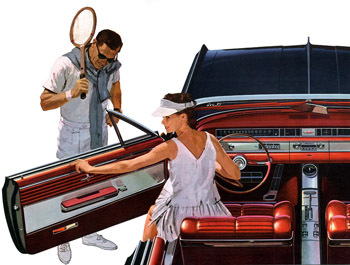 Never before such a Classic creation as Oldsmobile’s luxurious new Ninety-Eight Holiday Coupé! One look tells you that this sleek new beauty is a true aristocrat of the highways . . . one ride tells you that your driving holiday begins the moment you slip behind the wheel! You take command of the mightiest “Rocket” Engine ever built . . . Power Steering lets you park and turn with miraculous ease . . . Power Brakes give you quicker, surer stops — with 40% less effort! 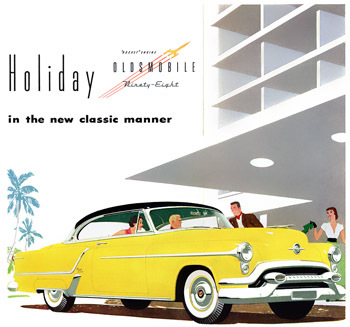 And to make your driving holiday complete, Oldsmobile offers Autronic-Eye for automatic headlight control. Make every motoring mile a thrilling new experience! See . . . and drive . . . this exciting new Classic! On display at your Oldsmobile dealer’s. Holiday, Oldsmobile’s designation for pillarless hardtops, started with coupes and spread to four-door sedans in the mid-1950s. This example from 1953 features the high-domed hood and various styling tchotchkes beloved of General Motors design czar Harley Earl. Someday there’ll be another car that combines the niceties of life with the thrill of the open road as neatly as the Starfire does. But not this year! From its bold new grille and functional fender vents to its exclusive dual chambered exhaust, this beauty’s new action silhouette says ’64 belongs to Starfire! Sample the fire of the 345-h.p. Starfire V8 Engine. 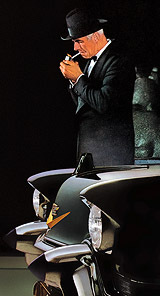 The quiet authority of T-stick Hydra-Matic, power steering and brakes. Along with leather-trimmed bucket seats and a smart sports console, they’re all part of the package! One thing’s for sure: When you flip the key to s Starfire, you’re pulling the pin on performance! For Valentine’s Day, a love match from Oldsmobile. The car is the 1964 Starfire convertible, whose bucket seats and shifter console said “sporty,” if a two-ton, 18-foot-long automobile can be called that. A tiny electronic device called the transistor has brought the magical world of robots much nearer than most people realize. No bigger than half a pea, this electronic marvel may make it practical for mechanical brains to run factories, operate inventory and warehouse control systems, read utility meters, make out bills, and perform other equally amazing feats. The transistor does about the same work as a vacuum tube, but takes up much less space . . . 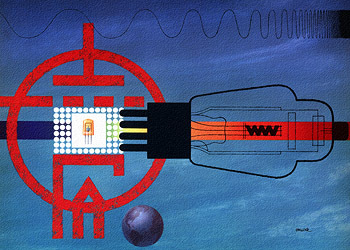 This 1953 illustration for National City Bank of New York could be titled “The Transistor and the Vacuum Tube: A Visual Allegory.” The artist is the now obscure Robert Hallock (1914-1982? ), who designed a number of postage stamps and did the jacket art for John Steinbeck’s novel The Wayward Bus. 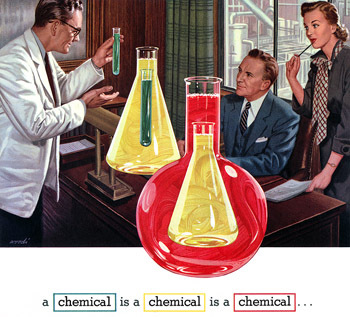 A chemical is a chemical is a chemical . . . sometimes it never ends. Chemicals have relatively few sources; they come from the limestone quarries, brine wells, coal, oil and gas fields, even the air around us. But linking these raw materials with the major chemical consuming industries is a complex operation . . . There is a conceptual thing going on here with Woodi Ishmael’s succession of nested beakers and progression of colors linked to the type below. We wonder if much explaining was involved, art direction- wise, or if someone just looked at it and said Wow, pretty test tubes! 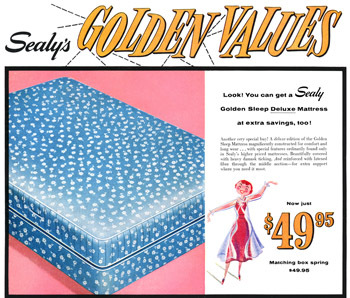 From 1958 comes this Sealy mattress ad with a blue and pink color scheme. Plus of course beckoning airbrush temptress in filmy negligee. Only $49.95!